The results Greg Neumann [representing the Mercury Laser Altimeter or MLA team] presented in March at LPSC used data that only ranged as far north as approximately 84 degrees. The two large MLA-bright deposits discussed at the press conference and in the Science paper are north of that latitude. We can only get MLA coverage north of 84°N by pointing the spacecraft off-nadir, and that was not done as often as nadir observations (and not done at all for the first six months of the mission). Once we started pointing off-nadir, we started getting coverage of the 'bald spot', but only slowly. It took a while to get enough tracks over those craters (Kandinsky and Prokofiev) to be sure we could measure a consistent bright signal. Basically, the MLA data presented at LPSC were in regions that got too warm to have large areas of stable surface water ice but could have water ice deposits buried by other material (and the MLA-dark measurements support thermal models hypothesizing organic material), but the colder areas closer to the pole can have larger expanses of stable surface water ice. The model data David Page presented here also did not include any MLA topography from within the 'bald spot', because that's what he had to work with at the time of his analysis. So he was unable to show the stability of water ice in the same craters that Greg showed. The longer MESSENGER can be kept running, the better our coverage in there will get. 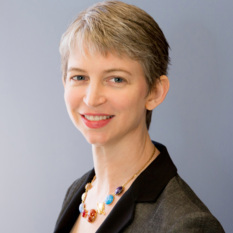 Carolyn doesn't say it, so I will: Let's hope MESSENGER keeps getting mission extensions funded in order to keep building up the data to support this really cool story! To explain the whole story, I'm hereby reposting my old article, in case you missed it in March! It's the morning of the fourth day of the 2012 Lunar and Planetary Science Conference, and I have to say that this one has been especially rich. It's very hard to choose what to write about. 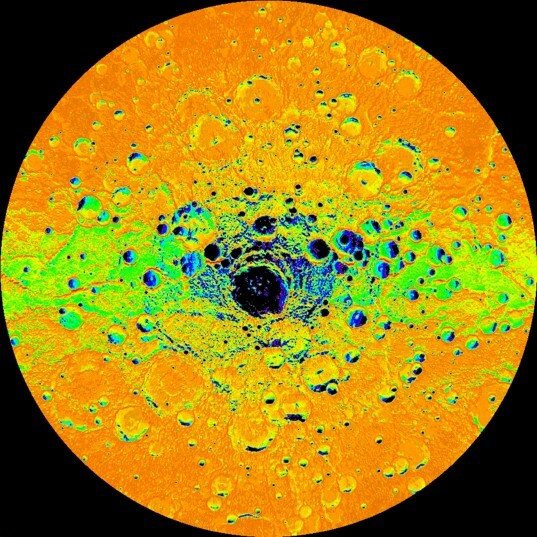 A nice little contained story is the one about water ice at Mercury's poles, a topic discussed in several talks yesterday. As Nancy Chabot told us in her talk, even before MESSENGER arrived we had some compelling evidence that there was ice at the poles. The Arecibo radio telescope had mapped the locations of unusually radar-bright material at Mercury's poles, material that modified radio waves in the way you would expect if it were water ice. 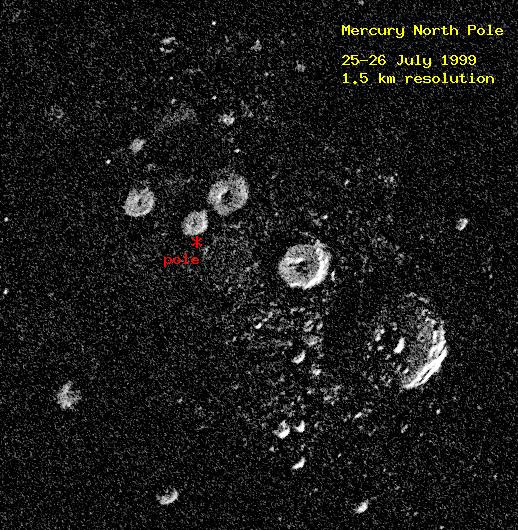 Arecibo Observatory S-band radar image of the north polar region of Mercury. The image measures 450 kilometers (280 miles) on a side. The bright features are bright to radar and could be ice deposits on permanently shadowed crater floors. With MESSENGER's photos of the north pole, Nancy confirmed that allof the radar-bright areas seen by Arecibo are within a few pixels of regions that MESSENGER has never observed there to be any sunlight. Furthermore, nearly all craters larger than 10 kilometers diameter above 80 degrees north latitude contain radar-bright deposits. The 10-kilometer diameter is significant because that's the diameter at which Mercury craters transition from simple bowl shapes to more complex shapes. The geometry of simple craters is such that their sun-facing slopes absorb and then re-radiate solar heat into their shadowed crater walls, making it too warm for water ice to last. Anyway, looking at her images, it's really shocking how good the match is between Arecibo bright pixels and MESSENGER dark ones. The highest-resolution radar image of Mercury's north polar region made from the Arecibo Observatory (Harmon et al., Icarus, 211, 37-50, 2011) is shown in yellow on a mosaic of MESSENGER orbital images. Radar-bright features in the Arecibo image all lie in areas mapped as in shadow in MESSENGER images to date, consistent with the proposal that radar-bright materials contain water ice. But there's a wrinkle. Greg Neumann presented some results from MESSENGER's Mercury Laser Altimeter that confused the issue a bit. (My own confusion also arises from the fact that they abbreviate Mercury Laser Altimeter "MLA," and every time any researcher said "MLA" my brain was determined to interpret that as my own name being mentioned.) The laser altimeter works by blinking a laser light at the surface and timing the return pulse; it's used to measure the topography, the highs and lows, of Mercury's surface. There's a happy by-product of the measurements of Mercury's topography, which is the brightness of the returned pulse of light. If there is ice in those shadowed regions, the flashlight of the laser altimeter should see a bright return pulse from the ice. But the laser altimeter didn't see a bright pulse. In fact, wherever the laser altimeter hits these shadowed areas, it actually finds a surface that is darker than the sunlit rocks. And Mercury is pretty dark to begin with, much darker than the Moon; yet the stuff in those permanently shadowed regions is even darker, reflecting less than 10% of the light that hits it. This does not look like ice, not at all. What could this stuff be? Well, temperature is a clue, and Dave Paige used the laser altimeter data to develop a model that showed what the average and extreme surface temperatures were at every spot near the poles. Here's a map that came out of one of those models. I'm not sure if this map shows annual extreme temperatures or annual average temperatures. You can see that there are dark spots within craters that are the coldest spots on this map. One other cool thing that I hadn't appreciated about Mercury is that its elliptical orbit combined with its 2:3 spin-orbit resonance results in some longitudes getting a lot more sun than other longitudes. Specifically, if you look at the map below, you'll see that there are colder temperatures at longitudes of 270 and 90 degrees (the left and right sides of this map) and hotter temperatures at longitudes of 0 and 180. Scientists refer to the 270 and 90 longitudes as the "cold poles." The temperatures right at the surface in these dark spots are actually too hot for water ice to be stable at the surface. However, dig 10 or 20 centimeters down, and you get to a region where the temperature is around 100 Kelvin, and ice is stable. The conclusion from all of this: the permanently shadowed craters do contain water ice, but it's not right at the surface; it's sequestered about 10 or 20 centimeters below the surface. What's at the surface, then? It's some dark material that is stable at 170 Kelvin. There are several different things this could be, but Dave said they were favoring the hypothesis that the dark stuff is complex organic compounds like those found in carbonaceous chondrite meteorites. These compounds would be volatile elsewhere on Mercury -- that is, they're not stable as solids, but rather as gases -- but would get trapped in cold, permanently shadowed areas just the same way that water ice would, at rather higher temperatures. 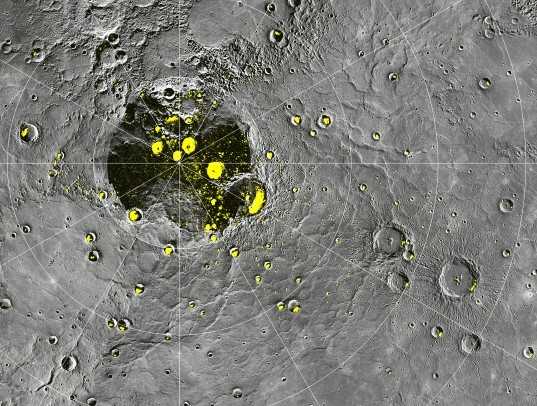 So: there's water ice at Mercury's poles, capped with a layer of carbon-rich material. Dave pointed out that this makes the permanently shadowed areas near Mercury's poles surprisingly habitable. Dig a very short distance below the surface and you have comfortable temperatures as well as access to water and organic material. One final set of observations corroborates these conclusions. David Lawrence presented preliminary results of a year's worth of mapping of Mercury's poles with MESSENGER's Neutron Spectrometer. He began by pointing out how challenging it is to operate a Neutron Spectrometer in MESSENGER's highly elliptical orbit; the varying distance from the surface and varying speed with respect to the surface have to be accounted for. Simulations of what the Neutron Spectrometer should see if there were ice at the poles at the surface do not match the Neutron Spectrometer observations. Instead, their maps match what they'd expect if the water were buried about 10 centimeters below the surface. These results will get even more robust with more measurements, as MESSENGER has been given a one-year mission extension. To begin the extended mission, they are going to burn through the rest of the oxidizer for their fuel in a maneuver to shrink their orbit from a 12-hour one to an 8-hour one. This will cut their apoapsis altitude from 15,000 to 10,000 kilometers. By getting closer to Mercury, they'll get better (or, if not better, different) measurements with the Neutron Spectrometer and other instruments that measure magnetic fields and energetic particles. Their gravity surveys will improve. They'll also be able to extend their laser altimeter mapping farther south. All good news! How does radar from Earth see such round craters at Mercury's north pole? I do not understand how the angles would work out? I would have assumed that would have been impossible given Mercury's lack of tilt. Although Mars and the Moon that also has ice at its poles would be better places for humans to explore, these new findings at Mercury would make it more feasible for humans to explore as well except keeping the temperature cool enough in the rocket capsule on the way there would probably be a problem and the radiation. However if future astronauts landed or set up a base near the poles of Mercury where there isn't much direct sunlight wouldn't the lesser sunlight and temperatures and the availability of water ice for water and oxygen and organics for plastics or fuel make Mercury near its poles much more feasible to explore or set up a base there on Mercury if they could get there? This could be good to monitor the sun more closely or get more first hand data of a planet close to its sun to better understand extrasolar planets near their parent stars. Landers and mobile science labs similar to Curiosity are likely in the planning stages for Mercury's near future. There is the suggestion that this dark stuff is likely a mixture of complex organic compounds, the carbon-containing building blocks of life as we know it. While the 2005 Deep Impact mission to Comet Tempel 1 discovered a mixture of organic and clay particles inside the comet, and the spectrum analysis of the asteroid 24 Themis presents evidence of water ice and organic material, I guess it is not such a stretch to say the "dark stuff" in water ice on Mercury is organic compounds (which most probably originated from a meteor or asteroid impact). However without an atmosphere, it is not likely that non-ice water would exist. The ice would rather instantly vaporize or sublimate into a gas upon any contact with the Sun. This is not an environment that nurtures life. This would suggest that the exploration of Mars for organic life should concentrate on those regions where spectroscopy measurements for high hydrogen concentrations provide likely indication for water ice. Amazing discovery! Mercury is not a dull world after all. A rover should be sent there to explore! This would be difficult but the rewards will be worth it. A few replies to comments: - I know of no future NASA plans to explore Mercury, not even proposed missions (at least not ones that have gotten very far in any selection process). ESA and JAXA will be launching Bepi-Colombo soon, but that's an orbiter. - No, MESSENGER can't really measure temperature. They get at the surface temperature through modeling; fortunately the physics can be simplified enough that modeling does very well at estimating temperature.